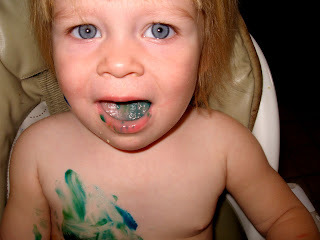 iderdider....: why infant sign language and finger paint don't mix. why infant sign language and finger paint don't mix. I don't need a sign to know that she thinks that's yucky. poor poor claire, she is not liking the finger paint. You know I have a good receipe for eatible finger paint its called pudding! An experiment all little one love to try. Does the paint taste good. Thomas did the same thing when he was Claire age.